Royal Brunei Airlines, the national flagship carrier of Brunei Darussalam, has boosted its commitment to environmental protection by partnering with a talented French start-up which provides a 360° solution to reduce fuel costs and CO2 emissions of airlines. 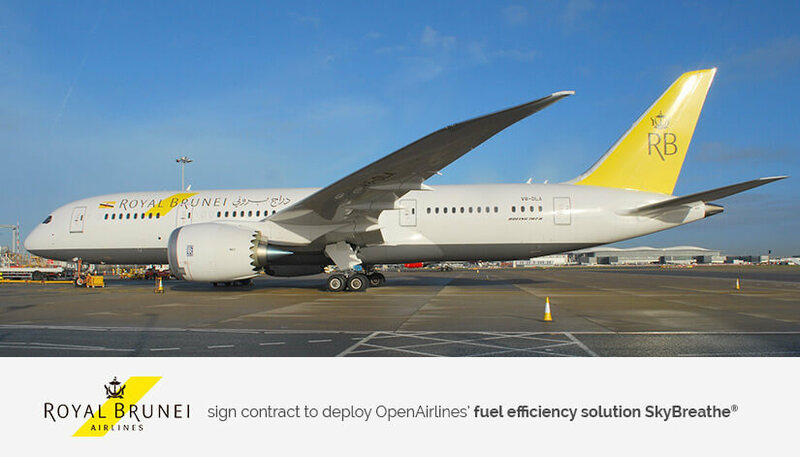 Under this agreement, Royal Brunei Airlines will use OpenAirlines’ flagship software SkyBreathe®Fuel Efficiency. The award winning software solution continuously monitors fuel consumption of each flight to identify the most relevant fuel saving opportunities using sophisticated, innovative algorithms and taking into account actual flight conditions. "We are thrilled to have been selected by Royal Brunei Airlines and look forward to a successful partnership. As fuel is the largest cost of an airline, it’s a win-win proposition for them. Burning less fuel is better for the environment and for their operating expense. Working closely with the ops team, we trust that our expertise will contribute to the growth of Royal Brunei Airlines in a short time.” said Alexandre Feray, OpenAirlines’ CEO. RB currently operates a fleet of ten aircraft comprising, four B787-8 Dreamliners together with six A320-200 units. RB also has one further B787-8 Dreamliner on order and has signed a contract with Airbus for up to ten A320neo aircraft, with deliveries starting in 2017. From its hub at Brunei International Airport, RB serves a number of regional and international destinations in Australia, China, Indonesia, Malaysia, Singapore, Hong Kong, Thailand, Philippines, Vietnam, United Arab Emirates, Saudi Arabia and the United Kingdom. It has codeshare partnerships with China Eastern Airlines, Turkish Airlines, Garuda Indonesia, Thai Airways, Hong Kong Airlines and Maswings. It has extensive interline partnerships with British Airways, Virgin Australia, Qantas Airways, Emirates, Safi Airways, Fly Dubai and Air New Zealand. In 2016, RB was announced as one the Top 10 Most Loved Airlines by Skytrax and Top 100 Airlines. OpenAirlines was founded in Toulouse, France, in 2006 to meet the needs of airlines to optimize their flight operations and reduce their costs. Leveraging a team of airline specialists and data scientists, it offers innovative software solutions to save fuel and CO2 emissions (SkyBreathe®), manage crews (CrewIntelligence™ and CrewPad™) and fleet (OptiFleet™).